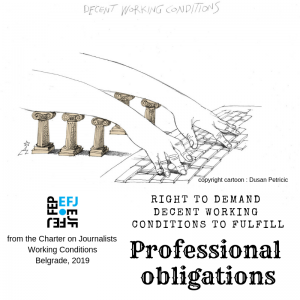 The EFJ Charter on Journalists Working Conditions is a guideline on working conditions, signed on 12 February 2019 in Belgrade (Serbia), by 14 journalists’ organisation representatives affiliated to the European Federation of Journalists and leading journalists’ unions from Western Balkans and Turkey. 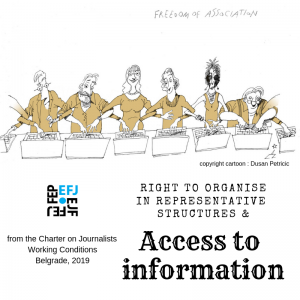 The Charter is open for signature to all journalists organisations, private or public media companies or authorities willing to commit to improve the working conditions and reinforce the labour rights of journalists and media workers in Europe, to fight against censorship and to promote free access to information and sources. 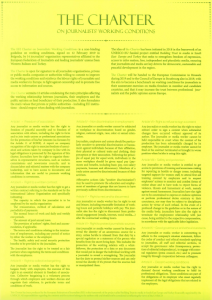 The Charter contains 10 articles condensing the main principles affecting the working relationship between journalists, their employers and the public opinion as final beneficiary of their production. 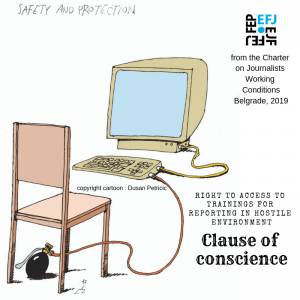 It also formulates the main values that private or public authorities – including EU institutions – should respect when dealing with journalists. 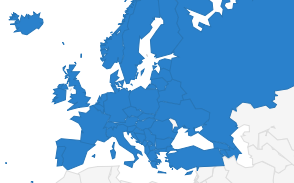 The idea of the Charter has been initiated in 2018 in the framework of an UNESCO-EU funded project entitled Building Trust in media in South East Europe and Turkey that seeks to strengthen freedom of expression, access to information, free, independent and pluralistic media, ensuring that journalists and media are key drivers for democratic, sustainable and peaceful development in the region. 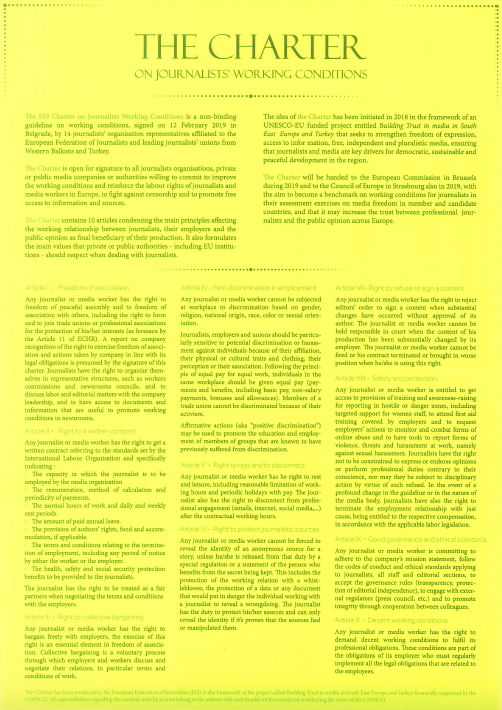 The Charter will be handed to the European Commission in Brussels during 2019 and to the Council of Europe in Strasbourg also in 2019, with the aim to raise to become a benchmark on working conditions for journalists in their assessment exercises on media freedom in member and candidate countries, and that it may increase the trust between professional journalists and the public opinion across Europe. Freedom of association Any journalist or media worker has the right to freedom of peaceful assembly and to freedom of association with others, including the right to form and to join trade unions or professional associations for the protection of his/her interests (as foreseen by the article 11 of ECHR). A report on company recognition of the right to exercise freedom of association and actions taken by company in line with its legal obligations is presumed by the signature of this charter. 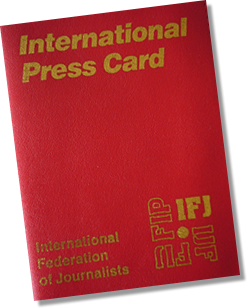 Journalists have the right to organize themselves in representative structures, such as workers commissions and newsrooms councils, and to discuss labor and editorial matters with the company leadership, and to have access to documents and information that are useful to promote working conditions in newsrooms. ● The remuneration, method of calculation and periodicity of payments. ● The normal hours of work and daily and weekly rest periods. ● The amount of paid annual leave. ● The provision of authors’ rights, food and accommodation, if applicable. ● The terms and conditions relating to the termination of employment, including any period of notice by either the worker or the employer. 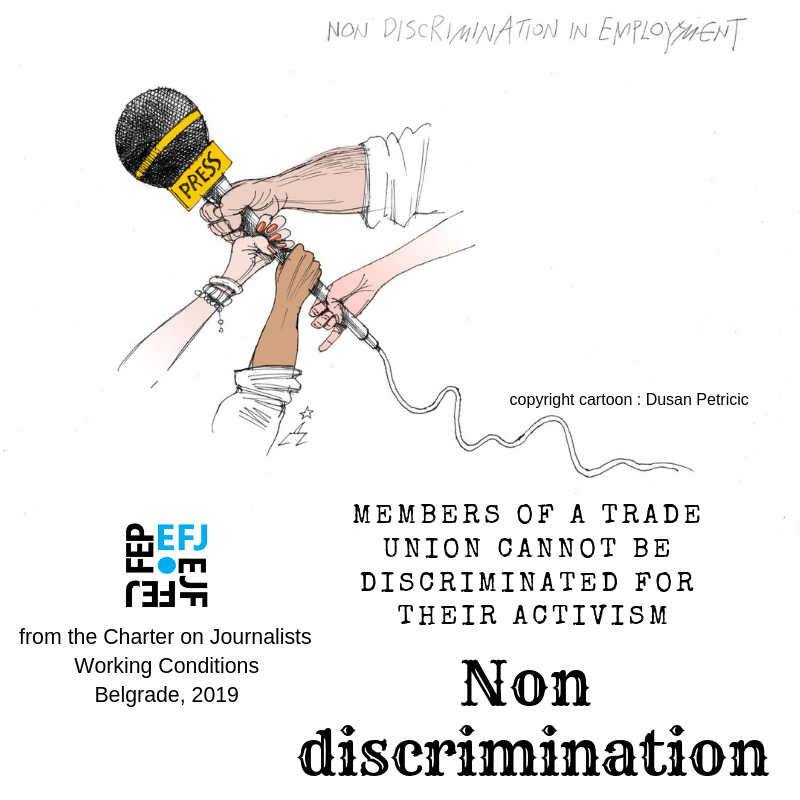 The journalist has the right to be treated as a fair partners when negotiating the terms and conditions with the employers. 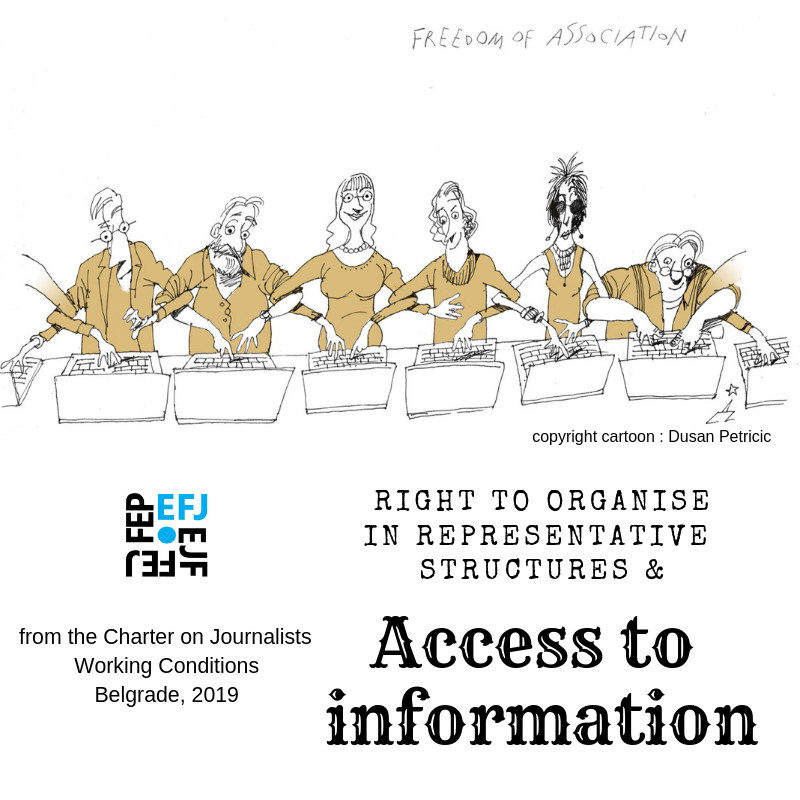 Right to collective bargaining Any journalist or media worker has the right to bargain freely with employers, the exercise of this right is an essential element in freedom of association. Collective bargaining is a voluntary process through which employers and workers discuss and negotiate their relations, in particular terms and conditions of work. Non discrimination in employment Any journalist or media worker cannot be subjected at workplace to discrimination based on gender, religion, national origin, race, colour or sexual orientation. 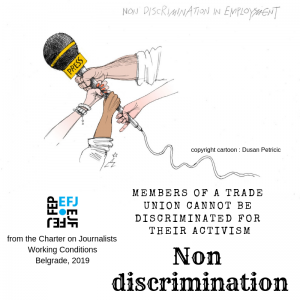 Journalists, employers and unions should be particularly sensitive to potential discrimination or harassment against individuals because of their affiliation, their physical or cultural traits and clothing, their perception or their association. Following the principle of equal pay for equal work, individuals in the same workplace should be given equal pay (payments and benefits, including basic pay, non-salary payments, bonuses and allowances). Members of a trade union cannot be discriminated because of their activism. Affirmative actions (aka “positive discrimination”) may be used to promote the education and employment of members of groups that are known to have previously suffered from discrimination . Right to rest and to disconnect Any journalist or media worker has he right to rest and leisure, including reasonable limitation of working hours and periodic holidays with pay. 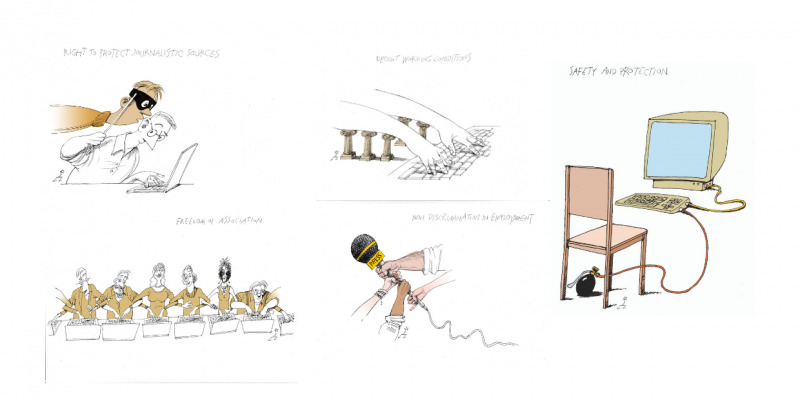 The journalist has the right to disconnect from professional engagement (emails, internet, social media,…) after the contractual working hours. Right to protect journalistic sources Any journalist or media worker cannot be forced to reveal the identity of an anonymous source for a story, unless he/she is released from that duty by a special regulation or a statement of the person who benefits from the secret being kept . 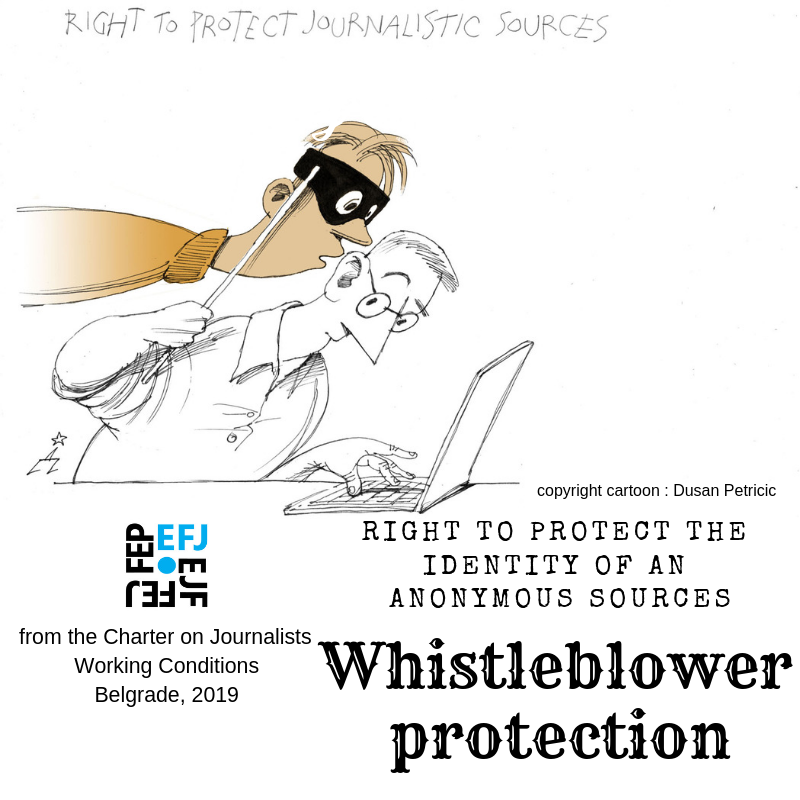 This includes the protection of the working relation with a whistleblower, the protection of a data or any document that would put in danger the individual working with a journalist to reveal a wrongdoing. The journalist has the duty to protect his/her sources and can only reveal the identity if it’s proven that the sources lied or manipulated them. 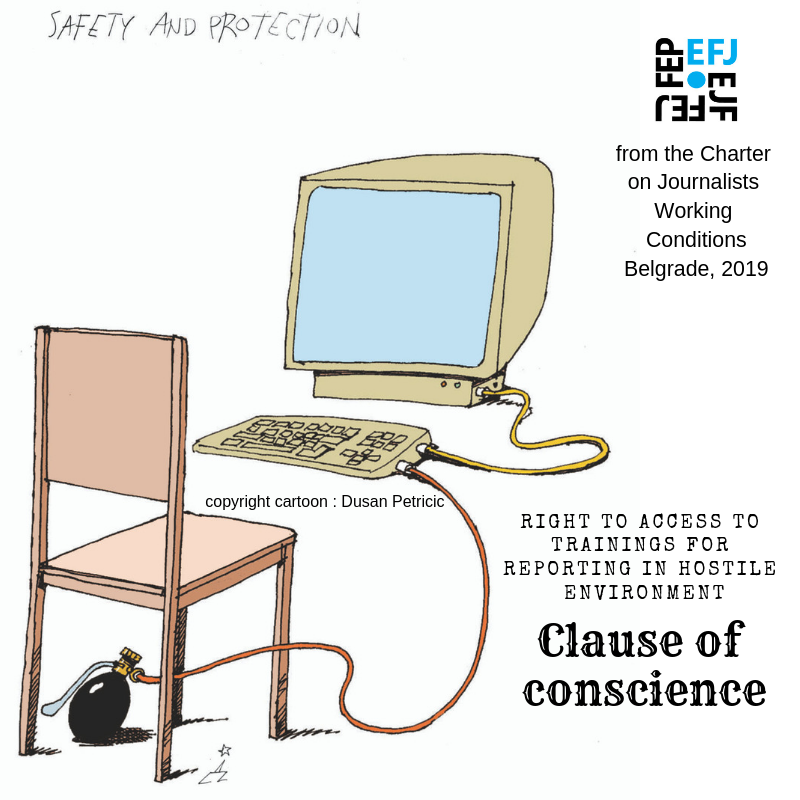 Right to refuse to sign a content Any journalist or media worker has the right to reject editors’ order to sign a content when substantial changes have occurred without approval of its author. The journalist or media worker cannot be held responsible in court when the content of his production has been substantially changed by its employer. The journalist or media worker cannot be fired or his contract terminated or brought in worse position when he/she is using this right. Safety and protection Any journalist or media worker is entitled to get access to provision of training and awareness-raising for reporting in hostile or danger zones, including targeted support for women staff, to attend first aid training covered by employers and to request employers’ actions to monitor and combat forms of online abuse and to have tools to report forms of violence, threats and harassment at work, namely against sexual harassment. Journalists have the right not to be constrained to express or endorse opinions or perform professional duties contrary to their conscience, nor may they be subject to disciplinary action by virtue of such refusal. 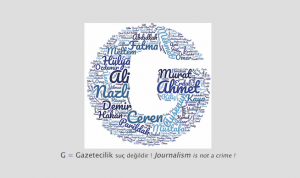 In the event of a profound change in the guideline or in the nature of the media body, journalists have also the right to terminate the employment relationship with just cause, being entitled to the respective compensation, in accordance with the applicable labor legislation. Good governance and ethical standards Any journalist or media worker is committing to adhere to the company’s mission statement, follow the codes of conduct and ethical standards applying to journalists, all staff and editorial sections, to accept the governance rules (transparency, protection of editorial independence), to engage with external regulators (press council, etc.) and to promote integrity through cooperation between colleagues. 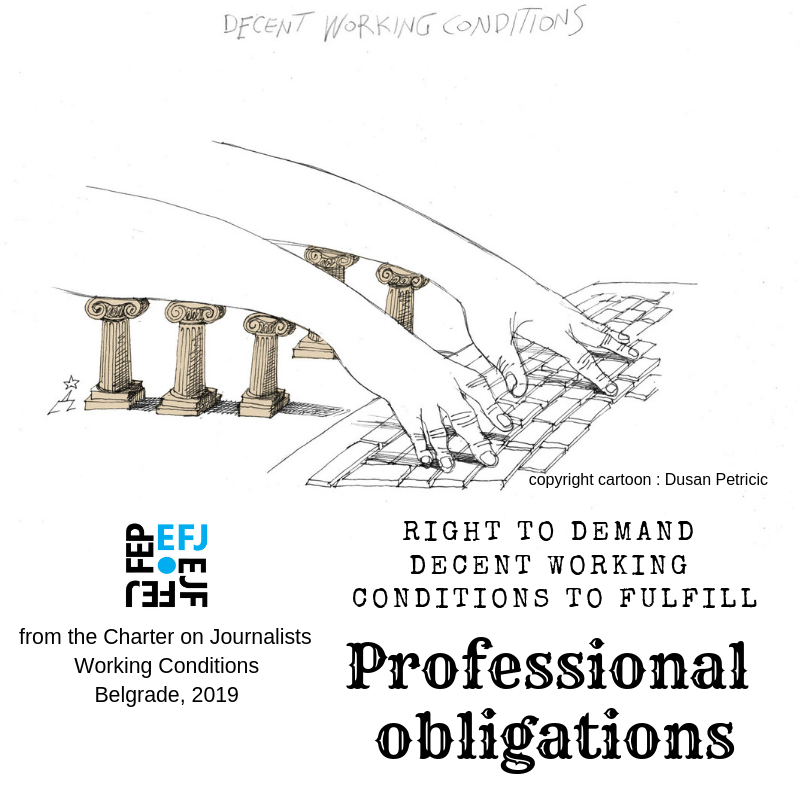 Decent working conditions Any journalist or media worker has the right to demand decent working conditions to fulfil its professional obligations. These conditions are part of the obligations of its employer who must regularly implement all the legal obligations that are related to the employees. Povelja je otvorena za potpisivanje za sve novinarske organizacije, privatne ili javne medije ili vlasti koje žele da se obavežu da će poboljšati radne uslove i jačati radna prava novinara i medijskih profesionalaca u Evropi, boriti se protiv cenzure i promovisati slobodan pristup informacijama i izvorima. Povelja sadrži 10 članova u kojima su navedeni glavni principi koji utiču na radne odnose između novinara, njihovih poslodavaca i javnosti kao krajnjeg korisnika njihovog rada. U njoj su takođe formulisane glavne vrednosti koje privatne ili javne vlasti – uključujući institucije EU – treba da poštuju kada sarađuju sa novinarima. Ideja o Povelji je pokrenuta 2018. godine u okviru projekta finansiranog od strane UNESCO-a i EU pod naslovom Izgradnja poverenja u medije u Jugoistočnoj Evropi i Turskoj koji je namenjen jačanju slobode izražavanja, pristupa informacijama, slobodnim, nezavisnim i pluralističkim medijima, kojom se utvrđuje da su novinari i mediji glavni pokretači demokratskog, održivog i mirnog razvoja u regionu. Povelja će tokom 2019. godine biti predata Evropskoj Komisiji u Briselu kao i Savetu Evrope u Strazburu, sa namerom da postane referentni dokument o radnim uslovima za novinare za ocenu slobode medija u državama-članicama i državama-kandidatima, i da poveća poverenje između profesionalnih novinara i javnosti širom Evrope. Svaki novinar ili medijski radnik ima pravo na slobodu mirnog okupljanja i mirnog udruživanja sa drugima, uključujući pravo na osnivanje i pridruživanje sindikatima ili profesionalnim udruženjima radi zaštite svojih interesa(kao što je predviđeno u Članu 11 EPLJP). Potpisivanjem ove Povelje kompanija preuzima obavezu da priznaje pravo na slobodu udruživanja i preduzima aktivnosti u skladu sa svojim zakonskim obavezama. Novinari imaju pravo da se organizuju u reprezentativna udruženja, kao što su radničke komisije i saveti u redakcijama, da sa rukovodstvom kompanije razgovaraju o radnim i uređivačkim pitanjima i da imaju pristup dokumentima i informacijama korisnim za unapređenje radnih uslova u redakcijama. Svojstvo u kom novinar treba da bude zaposlen u medijskoj organizaciji. Iznos nadoknade, metod obračuna, i učestalost plaćanja. Uobičajeno radno vreme i periodi dnevnog i sedmičnog odmora. Odredba koja se odnosi na autorska prava, hranu i smeštaj, ako je primenljivo. Uslovi za okončanje radnog odnosa, uključujući otkazni rok od strane poslodavca ili zaposelnog. Zdravstvena, bezbednosna i socijalna zaštita koja se obezbeđuje novinarima. Novinar ima pravo da bude tretiran kao ravnopravan partner u pregovorima sa poslodavcima o uslovima rada. Svaki novinar ili medijski radnik ima pravo da slobodno pregovara sa poslodavcima, a sprovođenje ovog prava predstavlja suštinski element slobode udruživanja. Kolektivno pregovaranje je dobrovoljan proces u kome poslodavci i radnici diskutuju i pregovaraju o svojim odnosima, a posebno o radnim uslovima. Na svom radnom mestu ni jedan novinar ili medijski radnik ne sme biti izložen diskriminaciji na osnovu pola, verske pripadnosti, nacionalne pripadnosti, rase, boje ili seksualne orijentacije. Novinari, poslodavci i sindikati treba da budu posebno osetljivi na potencijalnu diskriminaciju ili ugrožavanje pojedinaca na osnovu njihove pripadnosti, fizičkih ili kulturnih karakteristika i odeće, njihovih pogleda ili njihovih veza. U skladu sa principom jednake plate za isti posao, zaposleni na istom radnom mestu treba da dobijaju jednaku platu (platu i beneficije, uključujući osnovnu platu, uplate iznosa koji nisu plata, bonuse i dodatake). Članovi sindikata ne smeju biti diskriminisani zbog svog aktivizma. Afirmativne aktivnosti (tzv. „pozitivna disktiminacija“) mogu da se primenjuju radi promocije obrazovanja i zapošljavanja članova grupa za koje se zna da su ranije bile podvrgnute diskriminaciji. Svaki novinar i medijski radnik ima pravo na odmor i slobodno vreme, uključujući razuman broj radnih sati i povremene plaćene odmore. Po zavšetku svog ugovorenog radnog vremena, novinar ima pravo da se odvoji od svog profesionalnog angažmana (elektronska pošta, internet, društveni mediji, itd.). Nijedan novinar ili medijski radnik ne sme biti prisiljen da otkrije identitet anonimnog izvora za priču, osim ukoliko je oslobođen od ove obaveze posebnim propisom ili izjavom lica koje ima koristi od čuvanja tajne. Ovo uključuje zaštitu radnih odnosa sa uzbunjivačima izaštitu podataka i dokumenata koji bi doveli u opasnost lice koje sa novinarom sarađuje u cilju razotkrivanja neispravnosti. Novinar ima dužnost da štiti svoje izvore i sme da otkrije identitet izvora samo ukoliko se dokaže da je izvor lagao ili manipulisao. Svaki novinar ili medijski radnik ima pravo da odbije nalog urednika da potpiše sadržaj koji je suštinski izmenjen bez odobrenja autora. Novinar ili medijski radnik ne sme se sudski goniti u slučaju da je urednik suštinski izmenio sadržaj njegovog rada. Novinar ili medijski radnik ne sme biti otpušten, ugovor mu ne sme biti prekinut i on ne sme da se nađe u lošijem položaju kada koristi ovo pravo. Svaki novinar ili medijski radnik ima pravo na pristup obuci i podizanju svesti radi izveštavanja iz neprijateljskih ili opasnih zona, uključujući ciljanu podršku ženskom osoblju, pohađanje obuke iz prve pomoći koju organizuje poslodavac i da zahteva da se poslodavac uključi u praćenje i borbu protiv on-lajn zloupotreba, kao i na alate za izveštavanje o oblicima nasilja, pretnji i uznemiravanja na poslu,tj. seksualnog uznemiravanja. Novinari imaju pravo da se na njih ne utiče u odnosu na izražavanje i podržavanje mišljenja ili obavljanje profesionalnih zadataka suprotnim njihovoj savesti, niti se protiv njih u slučaju takvog odbijanja mogu pokrenuti disciplinski postupci. U slučaju suštinskih izmena uputstva ili prirode medijskog tela, novinari takođe imaju pravo da okončaju radni odnos sa pravičnim razlogom i imaju pravo na odgovarajuću nadoknadu u skladu sa valžećim radno-pravnim propisima. Svaki novinar ili medijski radnik se obavezuje da će se pridržavati izjave o misiji svoje medijske organizacije, postupati u skladu sa kodeksima ponašanja i etičkim standardima koji se odnose na novinare, osoblje i urednike, prihvatiti vladavinu zakona (javnost, zaštita uređivačke nezavisnosti), sarađivati sa spoljnim regulatornim telima (Savet za štampu, itd.) i promovisati integritet putem saradnje sa kolegama. Svaki novinar ili medijski radnik ima pravo da zahteva pristojne radne uslove da bi ispunio svoje profesionalne obaveze. Ovi uslovi predstavljaju deo obaveze poslodavca koji mora da redovno sprovodi svoje zakonske obaveze u odnosu na zaposlene.